← Previous: "Flight Over the Rockies"
Wow, this is awesome.. and pretty cool collage! Welcome home to Colorado.. and no snow! Jack, I had followed the blog during your travels but seeing all the pictures in one collection is even more stunning. It’s quite a cohesive collection. Thanks so much for sharing! Thanks Niran! Yeah I was surprised myself when I saw them all together… I didn’t realize I took so many photos! Poincenot Reflection…WOW! 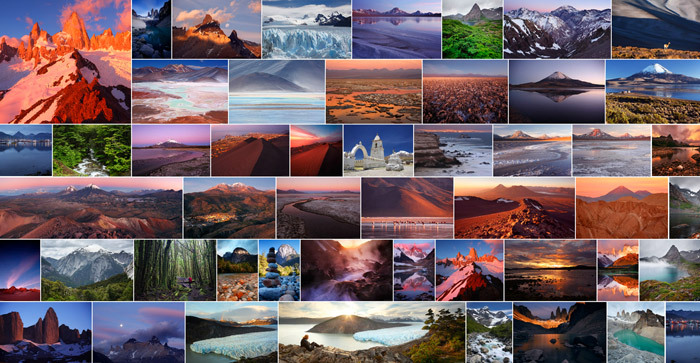 All the Fitz Roy pictures…WOW! All the panos…WOW. Great, great series, Jack. Another trip of a lifetime. How are you liking the snow in Ouray today? Thanks Justin, I’m glad you liked them! The snow is a very welcome sight! Just a dusting in town today, but the higher mountains look pretty white. Really a pleasure to look through this collection, Jack! I appreciate your inclusion of some daylight shots, too. More casual light may not be eye-popping on its own, but to me it provides some balance and better sense of place in the context of a big collection like this. And it’s also good for big colorful geologic structures; I’ve definitely found in my Dinosaur National Monument geology photos that super dramatic or very warm light can obscure some very neat structures in the landscapes. I am enjoying your blog for a couple of years now. (thanks to “The Online Photographer” by Mike Johnston, who once gave a link to your website). A short question: Did you only use digital cameras with TS lenses on this trip, or are some captures taken with your “old” LF film camera( probably much too heavy on such a trip)). I am asking as there are very different aspect ratios in this phantastic collection. Hi Uwe, yes these are all digital photos. With the T/S lenses, oftentimes I do shift “panos” with the lens shifted up and down, or left and right, for two shots that can be easily placed together for a square ratio, or a pano ratio. Stunning photographs – an inspiration. Keep up the great work.